By contrast, when you’re working with a singleton, like an object literal or an object created with the module pattern, there’s only one instance of the object. In this case, you should put the methods directly on the object. The jQuery library uses the module pattern to create a global singleton object named jQuery. That means there’s only one instance of jQuery. But when you create a jQuery plugin, you’re supposed to add your method to the jQuery.fn (or $.fn) object, which is an alias for the jQuery object’s prototype. But why? If the jQuery object is a singleton, why are we adding methods to it’s prototype? Further puzzling me, the jQuery plugin tutorial says “Whenever you use the $ function to select elements, it returns a jQuery object”. Hmm. 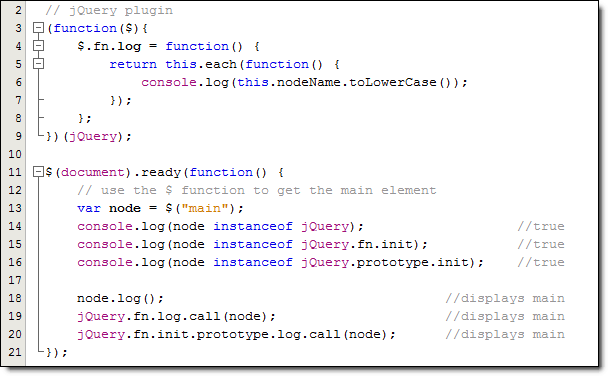 If jQuery is a singleton created by the module pattern, how is the $ function returning jQuery objects? Yesterday, though, I couldn’t take not knowing the answers for one more second. So I read some articles online and studied the uncompressed jQuery code (luckily the library isn’t too massive), and I think I’ve figured it out. Bear with me, though – things get a little circular. The jQuery object is indeed a singleton created with the module pattern, and the methods that jQuery uses are indeed on this singleton object’s prototype. But, crucially, one of the objects on that prototype is a constructor function named init. And, also crucially, the prototype of the init constructor function points to the prototype of the singleton jQuery object. Finally, most crucially, an instance of this init object is what is returned when you call the $ function. Another way to look at this is that the singleton object’s $ function is a factory that creates and returns instances of the jQuery.fn.init constructor function. And both the singleton and the instances of the init object are referred to as jQuery objects. And they have the same prototype, so anything I add to the singleton’s prototype is also available to the prototype of all the instances of the init object.